For our final dinner on La Turmalina the crew out did themselves. 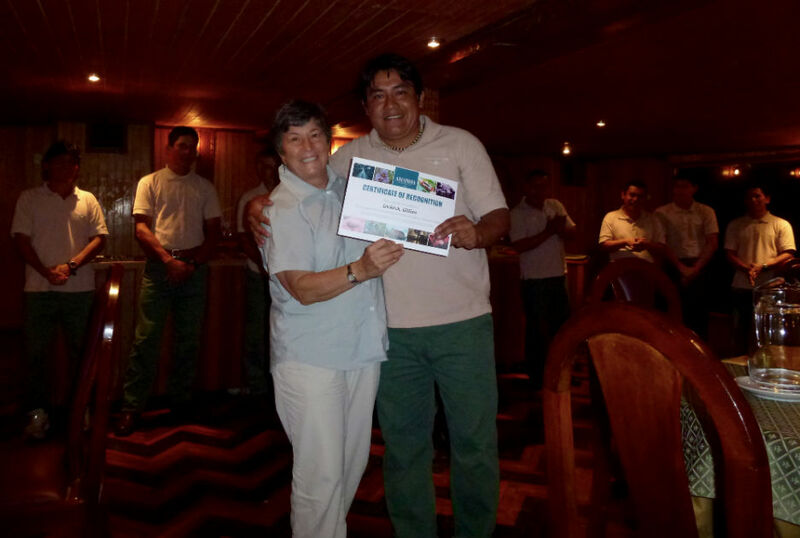 The entire crew from the Captain to the kitchen staff came out to be introduced and thanked by us all, and each of the guests was presented with a certificate showing that we had completed our week on the Amazon River. We were entertained by our multi-talented musical crew members with energy and enthusiasm. As two of us had an 8:30 flight from Iquitos to Lima to connect with a 12:50 PM flight to Buenos Aires, we had to leave the ship by 5:30 am for the long drive from Nauta to Iquitos. I had set my alarm for 4 am so I could shower and organize last minute packing. 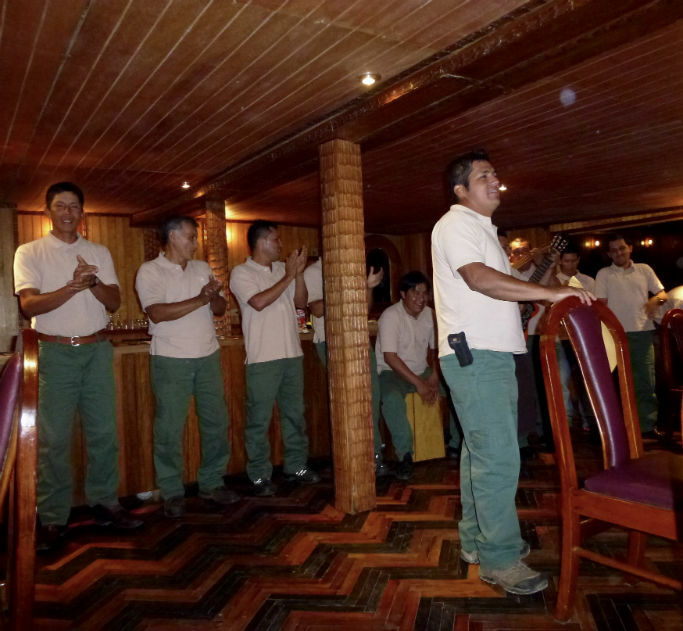 When I went into the dining room I was surprised to find coffee and a light breakfast prepared for us, but even more surprised to see that several members of the ship’s crew had actually got up at that time specially to say goodbye. A great ending to a once-in-a-lifetime, out -of-the-box experience for a luxury loving confirmed urbanite who hates heat and humidity, bugs and butterflies, moths and mosquitos and who got through the week with a few mosquito bites but many happy stories. And with the posting of Z: I have reached the end of the AtoZ Challenge April 2015. 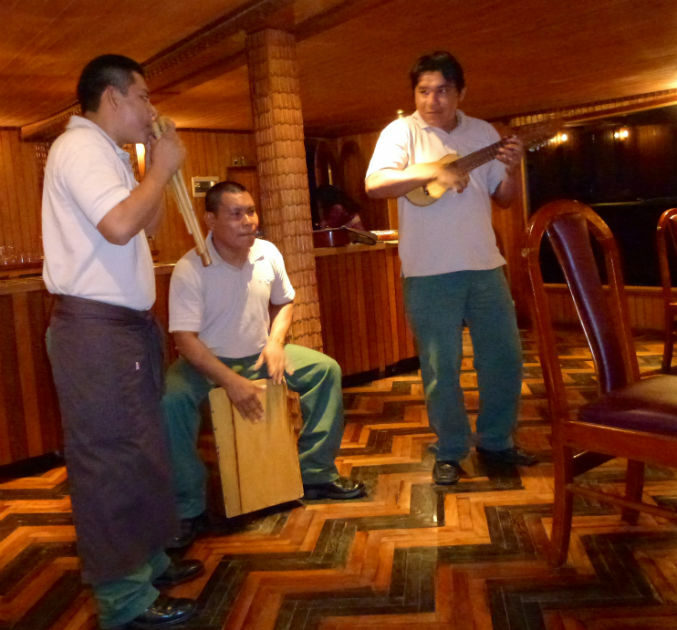 I hope you have enjoyed journeying with me on my Amazon River Peruvian Jungle Cruise. And that you will return to share my future posts on travel, food and wine, theatre and arts, and the best sport for keeping young and healthy - ballroom dancing.